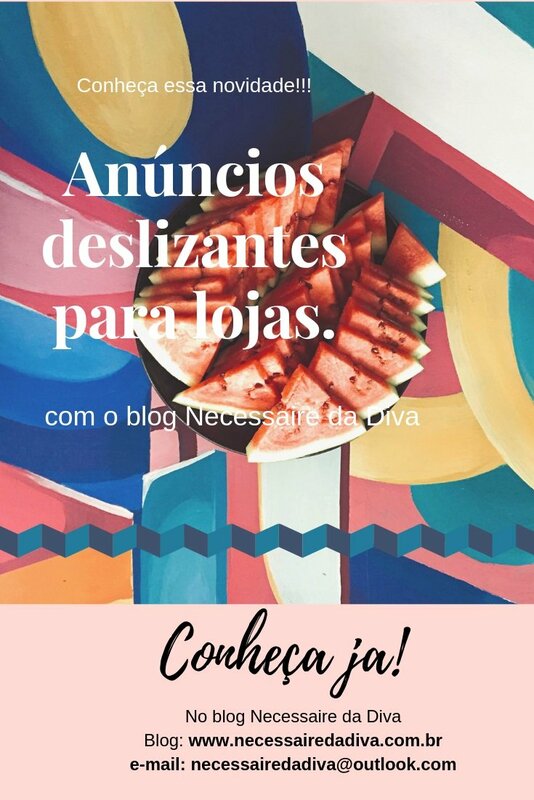 I want to advertise your products here in Necessaire Blog Diva?So Advertise aqui.Temos better dissemination for you that can be in the form of partnerships Or at prices more acessíveis.Aqui do not accept advertising or disclosure of adult content,violent or something similar. 1-Sliding ads or sliding Banners-we also have the novelty of sliding ads that are ultra modern,large and only appear in half of blog posts . 2-Ads or banners fixed– we have several sizes from 300×300, 728×90 and others. 3.We always use the tags “nofollow” on outbound links of our advertisers, according to Google standards. 4. Regarding the sending presskit for this Blog with the advertiser's products, is not post warranty on blog or disclosure in our social networks, However, if approved or we like the product can do from a simple blog posting or a simple post on a social network our. 5.If Post sponsored or publipost, readers will be informed that it is a paid item via marker “Sponsored post”. 6.We work with evaluation of products related to: Fashion, Beauty,Photos, Decoration, Food suplements,girly gifts in general e artigos de papelaria . We can send our media kit by email too.The values ​​will be informed through our e-mail.